Please start video, then click gear icon above for 720p video resolution. 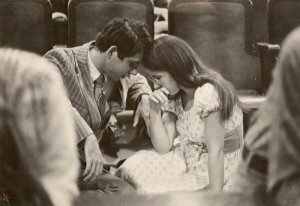 Discover the answer in this eyewitness account by Dennis Kinlaw, who served two terms as the Asbury College President, 1968-1981 and 1986-1991, located in Wilmore, Kentucky, who recounts the story of a visitation of the Holy Spirit in 1970. This is the presentation that has continued to spark the flames of Revival in the hearts of people around the world. Contains eyewitness footage from the Revival at Asbury College in 1970 in Wilmore, Kentucky. 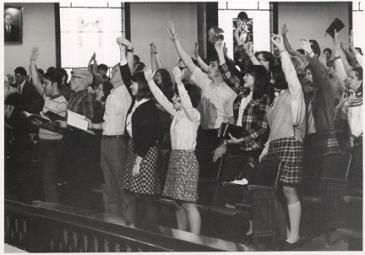 One morning in 1970, without warning, all heaven broke loose during Asbury College’s 10 a.m. chapel service. 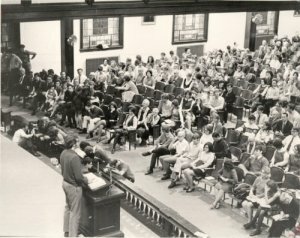 2014 marks the 44th anniversary of the landmark 1970 Asbury College revival, an unplanned, unled display of fervor that has been compared to the Great Awakenings of 1740 and 1800. The revival was strikingly similar to the revival Asbury experienced in 1950. Those signs include a generation of students wounded by family breakdowns and searching for spiritual fulfillment. Much of the coming revival will be a delayed reaction, McKenna thinks, to what happened at Asbury College over 4 decades ago. That’s partly why McKenna, the seminary president, thought a major revival could sweep college campuses in the 1990s. However, those campuses might as easily be in Eastern Europe, Africa or Latin America as in the United States. In December of 1991, 18,000 students from many different nations gathered at the University of Illinois for “Urbana 90” a triennial rally sponsored by InterVarsity Missions. McKenna thinks that the meeting might spark another Great Awakening, a multinational, multiethnic one. Some of its leaders might be the same people who were touched by the 1970 revival, who now are middle-aged and hold positions of church and college leadership. The next two VHS segments were produced later, in 1995 by Henry Blackaby via Broadman & Holman Publishers.